Garden City bullied Liberal on the boards in a 55-47 win over LHS in the Big House Tuesday night on Senior Night. Eight seniors suited up in the home whites in the Big House for possibly the final time. Liberal trailed throughout including 10-4 after one quarter, 23-17 at the half, and 34-25 after three. Caleb Tramp led the Buffaloes with 18 including a dunk as Liberal again struggled with Garden City’s defensive pressure in the first half. Britton Abbott scored 12 of his 14 in the first half of the loss. The Buffaloes sweep LHS for the second consecutive season. The Redskins are 6-13 overall and 1-6 in the WAC while the Buffs are 12-8 overall and 4-4 in the WAC. The boys basketball team will be featured during the Rowdy Crowd Show Thursday night at 5:30 on 1270 and kscbnews.net and live from Billy’s. 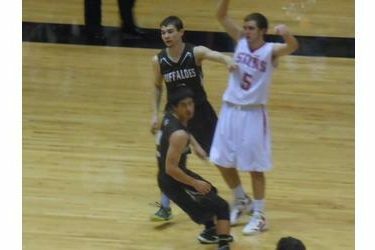 The Redskins play at Dodge City Friday night at about 7:50 on 1270 and kscbnews.net.